I like how Intel removed iGPU to lower the price, it is useless for most people and the CPU is 20% more affordable. I wish they did it sooner when I bought their CPU. But I thought 8400/9400F was much faster than 2600X in games, turns out they're pretty much the same. Since AMD has a quieter cooler and it's better in tasks other than gaming, has overclocking and has an upgradable, more future proof platform I'd say AMD is the winner here. Nightfire, evolucion8, TempleOrion and 7 others like this. Buy a cheap B360 board + cheap 2666 ram + i5 9400f. No need for overclocks or bios tweaks apart from activating XMP. Low power consumption. No need for great cooler or PSU. Buy a decent B450 board with decent VRMs + expensive Samsung B die 3200/3400 ram (200€ in Europe) + 2600x. Need to overclock it on the bios, tweak settings to find optimal perfrormance. Need a decent cooler for 4,2ghz on most chips, and it will use more power. In the end you get the same performance as Intel, slightly better on some games, slightly worse on others. olymind1 and bluetooth fairy like this. They paired the Ryzen chip with 3400 CL14 Ram that costs 220€ at least here in Europe. Hardware Unboxed being AMD biased as usual. If you drop that ram to 3000, wich most people will buy as it costs 100-120€, you will automatically loose 10% to 20% performance, specially on the 1% lows. Biased, that´s all I can say. Note the GPU is not absent on this chip, merely lazered off. These are defective chips, specifically with a defective GPU, and I wouldnt be surprised if stock isnt always present for them. Defective, low binned chips have been cheaper since forever. Its not like intel went and made a special iGPU less SKU with a new die. Veiran and MikitaM like this. The point of showing i5-9400F with DDR4-2666 was that it is max officially supported, and you can't get more unless you have a Z390 board, which could be expensive. Things are different for Ryzens. The most striking feature in this review (for me personally) was that there's the whole bunch of titles where the difference in 1% low or average fps between DDR4-3400 CL15 memory and DDR4-2666 CL15 was >= 10% even for an i5-9400f. 7 of 18 titles, actually: Hitman 2, Battlefield V, Shadow of the Tomb Raider, Monster Hunter: World, Strange Brigade, Star Wars Battlefront II, The Division 2. We already knew that DDR4 3200 is a must for Ryzen. And now we may come to a conclusion, that CFL i5 is also pretty hungry for memory. Would be interesting to see how the things are for i7-9700k with his 2 more cores. But TS will need to choose those applications/games that can really load these additional cores to ensure that memory is more heavily loaded either. I think it is a fair comparison here. The boards used for testing are roughly the same price and from the same company. The AMD board support slightly higher clocks without overclock. You can see that they overclocked the ram on the Intel board. And the ram they use on the AMD is CL15, not CL14 as per your other post. TempleOrion, mat9v, MikitaM and 1 other person like this. I like how Intel removed iGPU to lower the price, it is useless for most people and the CPU is 20% more affordable. I wish they did it sooner when I bought their CPU. Believe it or not, we wouldn't see 9400F if there were no shortages of their chips. The whole point was shortages, and AMD gains thereof. TempleOrion and olymind1 like this. Not a single word on Spectre and which patches were (not) used. Consequently, this "test" has no significance whatsoever. 10-20% difference between 3000 vs 3400? I smell some BS. In addition, you can easily overclock a 3000 to higher speeds. TempleOrion, Nightfire, mat9v and 3 others like this. This was over a year ago. I think we can assume here that they are on the recent BIOS and Windows versions. mat9v, Clynt and JaredTheDragon like this. Modern operating systems install the patches, sometimes including software patches, themselves. BIOS patches are not needed (would be redundant). Only recently new Spectre variants were made public. AMD wasn't vulnerable. Intel released patches a few days ago. There are likely more to come. This has to be specified when publishing such tests. "We used this and that system, with this and that patch-level." Otherwise, you don't have enough information to grasp the (in-)significance of the tests. I know its an old game, but removing gta v I think is an oversight. I think it is still very popular and favors intel quite a bit last time I checked. Having said that, Is AMD about to smash intel with their 3000 series??? Im excited to see some benchmarks! "When it comes to gaming it’s fair to say there’s no wrong option here and the Ryzen 5 2600X and Core i5-9400F are evenly matched." "If you're mostly playing games on your PC, you will be happy buying either processor. 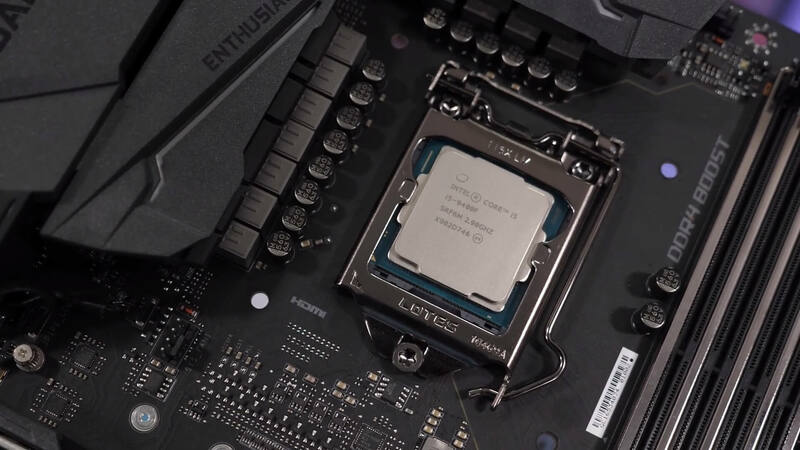 Both proved to be solid options and are evenly matched with a slight advantage to the Intel chip if you don't tune up the Ryzen processor." "Looking at those 1% low results, the 2600X was arguably more consistent, but for the most part you wouldn’t know which processor you were using." Cripes, Steve... at least try to conceal your "usual" AMD bias a little bit. hahahanoobs, TempleOrion, mat9v and 3 others like this. Hi Steve! Thank you for another great comparison. This time I must say it felt biased. I have been following you for a couple of years now and I know perfectly that you aren´t a shill in any way and present objective data. I hope you can take this as constructive criticism rather than hate. I think that the problem was when choosing how to test the CPUs, and of course in the conculsion of it all. I believe that pairing a ryzen 2600/x with Ddr4 3400 is not ideal, since people wanting to buy a midrange CPU won´t necessarily be pairing it with ultra expesive memory (In third world countries like mine, the best you can get from good sellers are 3200mhz cl 15 kits). Speaking of budget oriented buying, I think it would have been better to use the non X version of the Ryzen chip. Adding up to the "budget" argument, I don´t believe that a Corsair h115i pro is a realistic cooler for someone buying a midrange CPU (maybe the hyper 212 evo or similars would have fit a lot better). It is nice to see the power of the new Ryzen chips unleashed with high speed and low latency memory, it excites me seeing the competition doing so well, but honestly reading your article was like reading something written more by a fan than by a neutral reviewer. Nightfire and olymind1 like this. The article lacks power measurement numbers, and being in the context of it, we can't really discuss how power hungry 9400F truly is. Another disadvantage of a stock 9400F is that it lacks sTIM, uses thermal paste under the cap instead. We also should keep in mind, that we'll get 8 cores for a mainstream CPU pretty soon. For the previous year it was 6-cores, and for 2019 it's 6 core-CPU still. Ryzen 5 has 12 threads at least, though. TempleOrion and xxLCxx like this. There are some rumors pointing that 300-series won't support Zen 2 , does anybody know about this? Yeah, I forgot. And if you buy a 2444Mhz RAM for 800$ instead of 3000MHz which costs 50M$ you lose additional 150% performance. Damn bias. TempleOrion, mat9v and MikitaM like this. All boards will support the new CPUs after you update the BIOS. Hari Seldon and xxLCxx like this. You copy-pasted the comment from youtube where it got destroyed because of it's awful arguments that break down once you actually look at the numbers and even prices (and yes, I live in the EU and I know the prices there). Out of the box the 2600x is just better hands down. Nobody in his right mind will sacrifice double the threads and a more future proof platform just to get on average 4 extra FPS and 0 extra FPS at the 1% lows in games. You'll also need the most expensive GPU on the market to even see those 4 extra FPS. FYI you can easily find 3200MHz RAM for 110-115 euro in the majority of Europe. Tighten the timings on those or OC them and you'll get within 1-2% of the 3400MHz RAM used here. You don't need to OC the 2600x. On a side-note, unless they have a crappy system all gamers generally have software running in the background which will benefit the 2600x more with its extra 6 threads. I personally never close Chrome and even game while listening to youtube or Twitch. Next time please don't "copy-pasta" and actually write something worthwhile. wildrage, Nightfire, TempleOrion and 8 others like this. Using stock cooler on the 2600x at it runs at a reported 4.075 GHz , I don't think spending a fortune on an aio for another 1.25ghz is going to boost performance that much. MikitaM and xxLCxx like this. Even 30% on the min fps on a lot of games. Ryzen depends a lot on imc.